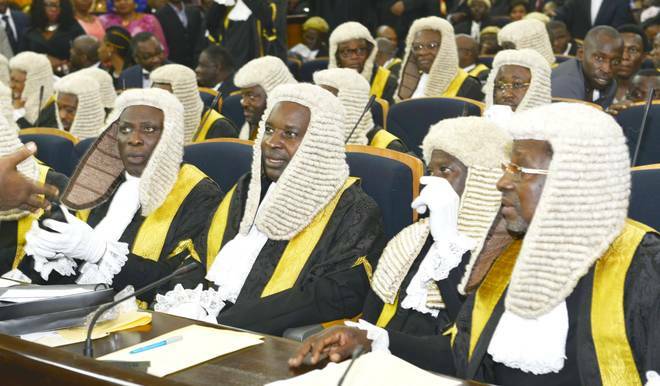 The Legal Practitioners Privileges Committee (LPPC) has announced 31 lawyers as Senior Advocates of Nigeria (SAN). The new list was announced during a briefing at Supreme Court complex in Abuja on Thursday. Oba Maduabuchi Esq, Essien Essien Udom Esq, Prof Oluyemisi Adefunke Bamgbose, Metong Bertram Robert Urombo Esq, Prof. Wahab Olasupo Egbewole, George Chiedu Igbokwe Esq, And Olubowale Taiwo Esq. Others are; Oluwole Osamudianie Iyamu Esq, Adekola Adeyeye Olawoye (Attorney General Of Ondo State), Stephen Oj Omeko Zakari Adehi Esq, Oluseun Takintayo Akinbiyi Esq, Emmanuel Ozoemenam Achukwu Esq, Kenneth Chukwuemeka Ahia Esq, And Louis Maduforo Alozie Esq. Prof. Isa Hayatu Chiroma (Dg Nigerian Law School), Prof. Olanrewaju Adigun Fagbohun (Vc Lagos State University), Adeyinka Patrick Olumide-Fusika Esq, Johnson Olalekan Ojo Esq, Wole Seun Agunbiade Esq, Olayode Olumide Delano Esq, Tanimu Muhammed Inuwa Esq, Sonny Oluchukwu Wogu Esq, Prof. Offorinze Dike Amucheazi, Adewale Eyitemi Atake Esq, And Ikhide Ehighelua Esq, All Made The List. Others include; Mosediq Adeniji Kazeem Esq (Attorney General Of Lagos State), Edmund Chinonye Obiagwu Esq, Prof. Muhammed Mustapha Akanbi, Cosmas Ikechukwu Enweluzo Esq, Ishaka Dikko Mudi Esq, And Olabode Olutoyin Olanipekun Esq. The Secretary of the Committee, Hadizatu Mustapha said the successful candidates will take their on oath on September 24.